With the sun in Cancer (containment) and the moon in Aries (entrepreneurial spirit), today is a Three of Wands day. On a divinatory level, the Three of Wands implies initial completion of some important project or idea. The foundations have been laid – the first feedback is positive – there’s promise and potential – but of course – there’s more work to be done before the project is fully baked. For the Kabbalist, today’s energy relates to the 3rd sephira, Binah, which represents the female principle of creative power from which all things are born. While the 2nd sephira, Chokmah, represents the male principle Force, it is in Binah, that this potency gives way to Form. It’s rather like the title of a popular 1940’s comedy film ‘And Baby Makes Three’. 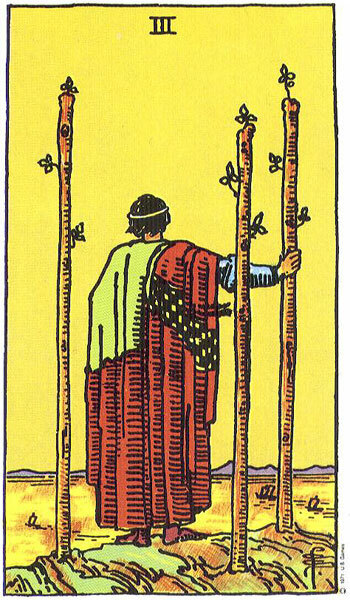 As with all tarot threes, the Three of Wands suggests strength and stability. In numerology, the number three symbolizes the holy trinity – Father, Son and Holy Ghost – birth, life, and death – past, present, and future. Yet just as we stand surveying our bounty on this solid ground, in our hearts we know all too well that it will change and grow – for everything on this earth is born to die. So on a Three of Wands day, take time to honour that which your determined efforts have wrought. But don’t take too much time – for now is not the time for procrastination. With your shirtsleeves rolled up you will soon need to recommence your toils with renewed optimism if that is – you wish to fully realise your ambitions.